Fiat and Chrysler are currently facing up to a long-term future together that will see the two carmakers, that have very different values, interlocking in virtually every practical area, and very quick off the mark, the third year students on the "Transportation Design" course at the Istituto Europeo di Design (IED) in Turin have offered their interpretations of a future fusion of design ideas. The IED is one of Europe's more ambitious design schools and has built a tradition for presenting innovative and well-presented full-scale 1:1 models at the Geneva Motor Show in recent years. These include the Maserati Chicane (2008), a sports car that adhered to true Trident style design values, beON (2007), a futuristic off-road vehicle, Lancia Haizea (2006), a sedan that encompassed the brand's inherent pursuit of sports and luxury motoring, and the X1/99 (2005), a small two-seat sports car with a well thought out electric solid folding roof section that sought to revive the much-loved historical spirit of the Bertone-designed Fiat X1/9. In Geneva this year students from the IED Transportation Design course showcased a trio of scale models for budding Italian carmaker DR Auto, taking a close look at an advanced supercar that the firm hopes to build in the future, and which could be voted on by visitors during the prestigious motor show. Fiat and Chrysler only outlined a bold plan to join forces in January and the deal, which sees Fiat taking an initial 20 percent stake in Chrysler, was clinched in the summer as Chrysler emerged from the bruising Chapter 11 bankruptcy process, while a 5-year plan for the U.S. auto giant will be outlined in detail in a week's time. The students of the IED were fast of the mark, the 37 members of the 2008-09 course taking on the bold subject of evolving a new design language in February, the unfolding agreement leaving them totally open to fresh thinking from a blank piece of paper, but also posing a tough undertaking. 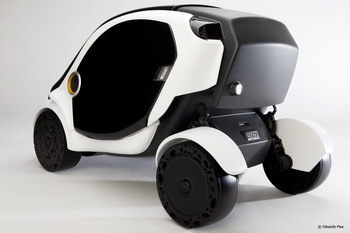 The project challenged the students to rearrange the values of Chrysler and Fiat's technology, platforms and values: on the one hand there is the style, economic accessibility and low environmental impact noted of the Italian firm, while for the faded star of Chrysler there is the ongoing assessment of new platforms and manufacturing processes from a company that is slanted towards producing larger vehicles. "Competitive values whose union can generate interesting new products on the European market as well as the American one," stated the IED. "A brief that obligates the students to be confronted with their own vision of the future and with evolving the real relationships between the two marques, which in the course of the project, reach to a definitive and historical agreement," the school added. 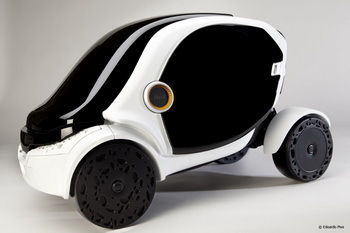 "Which will be the vehicles of tomorrow? The union between Fiat and Chrysler with offers potentialities in order to find an answer shaped to this question," comments César Mendoza, Director of IED Turin. To put the students to work before the agreement is even signed, he adds, "has represented for our school a true challenge." The projects focused on both interior and exterior designs, using Alias software, under the guidance of an experienced team of tutors, and in July the students gained a boost to their learning curve when they visited Fiat Centro Stile, also located in Turin. Eventually the projects were whittled down to 13 and now two projects have been chosen to be developed further into 1:4 scale models. 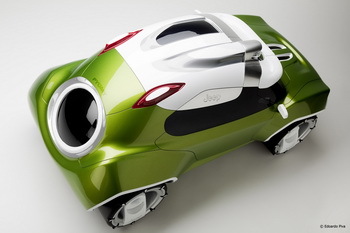 "Biov" is a proposal by Roberto Testolin, a small ecological car that will be cheap to produce and have a very low environmental impact. Made out of light plastics that will be low-cost to manufacture it also foresees a series of overlapping components that will reduce the assembly cost further. 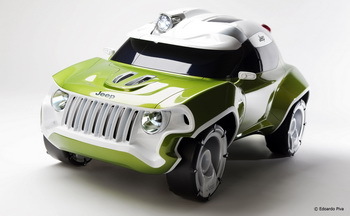 Meanwhile the other project to be taken a step forward is "Jeep PYGMY" by Vasiliy Kurkov. This small car is based on the robust Fiat Panda Cross 4x4 architecture and while it is deeply embedded with a European character it seeks to also incorporate the America style, culture and tradition of the famous Jeep brand. Kurkov's idea is to create a vehicle that will be easy to transform quickly from a functional 'shopping' vehicle to one with off-road 'rally' style and it is embedded with a fashion-conscious interior that features many retro details, aiming to transmit to the customer a feeling of quality and luxury.